Start off your visit on the 24th (Wed): enjoy the sand and surf at Ponta Negra Beach. For photos, where to stay, more things to do, and more tourist information, read our Natal trip itinerary planning app . Fortaleza to Natal is an approximately 3.5-hour flight. You can also drive; or take a bus. 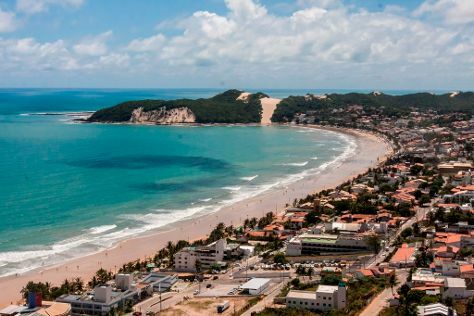 Traveling from Fortaleza in July, you can expect nighttime temperatures to be slightly colder in Natal, with lows of 24°C. Finish your sightseeing early on the 24th (Wed) to allow enough time to travel to Lisbon. Explore the numerous day-trip ideas around Lisbon: Sintra (Quinta da Regaleira, Castelo dos Mouros, & more). The adventure continues: admire nature's wide array of creatures at Lisbon Oceanarium, take a stroll through Belém Tower, make a trip to Santa Justa Lift, and take in the views from 25 de Abril Bridge. To find more things to do, ratings, photos, and other tourist information, use the Lisbon trip planner . You can fly from Natal to Lisbon in 10 hours. You'll lose 3 hours traveling from Natal to Lisbon due to the time zone difference. Traveling from Natal in July, you can expect nighttime temperatures to be a bit cooler in Lisbon, with lows of 20°C. Cap off your sightseeing on the 27th (Sat) early enough to go by car to Albufeira. Start off your visit on the 28th (Sun): stroll through Percurso dos Sete Vales Suspensos, take in the dramatic natural features at Ponta da Piedade, and then don't miss a visit to Lagos Farol da Ponta da Piedade. Get ready for a full day of sightseeing on the next day: find something for the whole family at Zoomarine Algarve - Theme Park. To see photos, maps, where to stay, and other tourist information, use the Albufeira holiday builder app . You can drive from Lisbon to Albufeira in 2.5 hours. Other options are to take a bus; or take a train. In July in Albufeira, expect temperatures between 34°C during the day and 23°C at night. Cap off your sightseeing on the 29th (Mon) early enough to travel to Barcelona. Barcelona is known for parks, nightlife, museums, shopping, and fun & games. Your plan includes some of its best attractions: make a trip to Basilica of the Sagrada Familia, stroll through Parc Guell, pause for some photo ops at Casa Batllo, and browse the fresh offerings at La Boqueria. To see ratings, more things to do, and other tourist information, you can read our Barcelona online attractions planner . Do a combination of bus and flight from Albufeira to Barcelona in 5 hours. Alternatively, you can do a combination of train and flight; or drive. Traveling from Albufeira to Barcelona, you'll lose 1 hour due to the time zone difference. In July in Barcelona, expect temperatures between 34°C during the day and 25°C at night. Wrap up your sightseeing on the 1st (Thu) early enough to travel to Nice. Step out of Nice with an excursion to Massif de l'Esterel in Agay--about 56 minutes away. Spend the 3rd (Sat) in some colorful company at Marineland. And it doesn't end there: wander the streets of Vieille Ville, take in the spiritual surroundings of Cathedrale Sainte-Reparate, stroll the grounds of Cimetiere du Chateau, and take some stellar pictures from Colline du Chateau overlook. To find more things to do and other tourist information, you can read our Nice trip itinerary website . You can do a combination of flight and train from Barcelona to Nice in 4.5 hours. Alternatively, you can drive; or take a train. Expect a daytime high around 32°C in August, and nighttime lows around 25°C. Wrap up your sightseeing on the 4th (Sun) early enough to travel to Ibiza Town. Ibiza Town is known for beaches, nightlife, historic sites, nature, and outdoors. Your plan includes some of its best attractions: get a new perspective on things with Catamaran Ibiza Charteralia, have fun at Kentucky Derby, tour the water at your own pace with Halo Luxury - Alquiler de Barcos, and take a memorable tour with Moloko Luxury. For ratings, reviews, and more tourist information, use the Ibiza Town trip itinerary planner . You can do a combination of train and flight from Nice to Ibiza Town in 4.5 hours. Other options are to do a combination of train and flight; or do a combination of car and ferry. Expect a daytime high around 35°C in August, and nighttime lows around 26°C. Finish your sightseeing early on the 7th (Wed) to allow enough time to travel to Madrid. Madrid is known for museums, nature, shopping, nightlife, and historic sites. Your plan includes some of its best attractions: see the interesting displays at Prado National Museum, browse the exhibits of Monasterio de las Descalzas Reales, admire the masterpieces at Museo Nacional Centro de Arte Reina Sofia, and admire the striking features of Royal Palace of Madrid. To find ratings, photos, other places to visit, and tourist information, read Madrid itinerary planner. Traveling by flight from Ibiza Town to Madrid takes 3 hours. Alternatively, you can do a combination of ferry and car; or do a combination of ferry and train. Traveling from Ibiza Town in August, you will find days in Madrid are somewhat warmer (39°C), and nights are a bit cooler (22°C). On the 10th (Sat), wrap the sightseeing up by early afternoon so you can travel back home.